MUMBAI: The Patola hitmakers track High Rated Gabru was a big hit with 400 million views on YouTube, but the song is set to make it bigger with T-Series. The songs now a part of Varun Dhawan and Shraddha Kapoor starrer Nawabzaade. 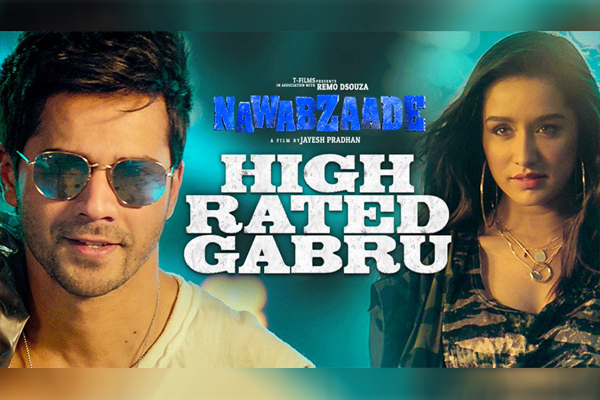 The above ‘Shraddha-Varun’ version of the song is sure to pump you up with that glitter the song showcases. The background effects would be a treat for your eyes, with the leads killing it with their dance moves. This song has got its fame with its popularity buzzing it trends at number one and has crossed almost 20 million views in just a day. MUMBAI: Music producer Abhijit Vaghani, who is one of the creators of the popular music property, T-Series Mixtape, reveals about his experience of singing with Shekhar Ravjiani and Neeti Mohan. MUMBAI: Guru Randhawa’s latest release with American rapper Pitbull, Slowly Slowly has become a record breaker in spite of receiving mixed response. And latest we hear that the High Rated Gabru’s blockbuster song took over the upcoming episode of T-Series Mixtape Season 2.